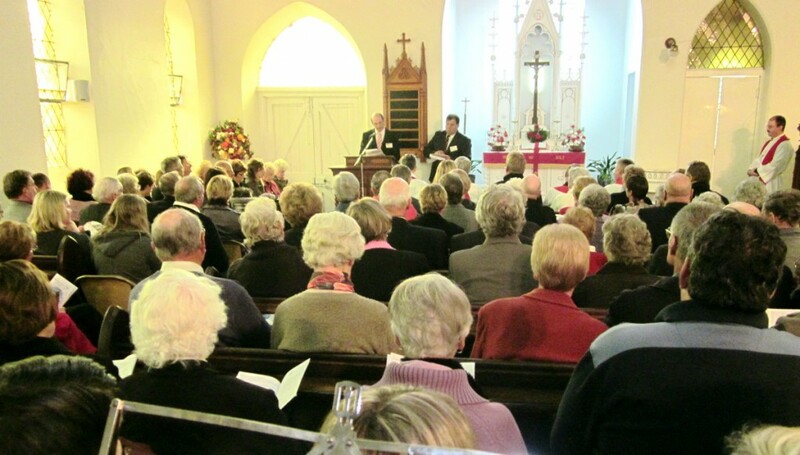 The Pella community provided an excellent weekend program on 14–15 Mat, 2011, for the Centenary celebration of the dedication of their church building, which took place on 14 May 1911. The officiating Pastors in 1911 included N. Wiese, E. Kriewaldt, O. Mueller and J.F. Noack. The generally accepted origin of the name “Pella” is that it is derived from the town “Pella” in trans-Jordan, to where the early Christians from Jerusalem fled in 70 C.E. This is the date when Titus, the son of the Roman Emperor Vespasian, destroyed both Jerusalem and the Jewish Temple on Mt Zion, a flight recorded by the church historian Eusebius. The large Marquee with tables and seating was a excellent facility for events and meals; for meeting up with friends and relatives; for catching up on news and for recalling previous Pella days. The registration, afternoon tea and energetic socialising from 3pm on Saturday was followed at 5:30pm by the launching of the reprint of “The Story of Pella”. The research for this book had been begun in the context of St John’s 60th Anniversary by the “Back to Pella Committee”, which included John and Ross Heinrich, Syd and Rudy Drendel, Louis Keller, Mick and Stuart Mitchell and John Noack. An important task was to set up files on the various district activities, such as farming, education, church life and sport, to collect information, documents, photos and personal memories of the Pella residents and to record and compile the history of the Pella community. Ian Maroske was approached about researching this Pella area further and about eventually writing a book about Pella. He agreed to this and continued the research with the full support and enthusiasm of the Pella Book Committee. Being located at Horsham, Ian was able to conduct many interviews and to collect many photos and documents from former Pella residents who had moved to Horsham in retirement but who could recall many memories about Pella. The book is widely viewed as an excellent and early example of Australian “grass-roots history”. Since this book covers the years from about 1911 to 1975, perhaps plans can be made to document Pella’s next 60 years from 1975 to 2025. After tea in the marquee on Saturday evening, “Pella Moments” allowed family representatives, including the Schillings, Mackenzies, Heinrichs and the local Cr. Ron Lowe, to extend their greetings and to recall memories of life at Pella. John Noack described the discovery and purchase of Pella’s magnificent 1885 Fuller pipe-organ, which has tracker-action and was located in the Howe Crescent Congregational Church in South Melbourne. 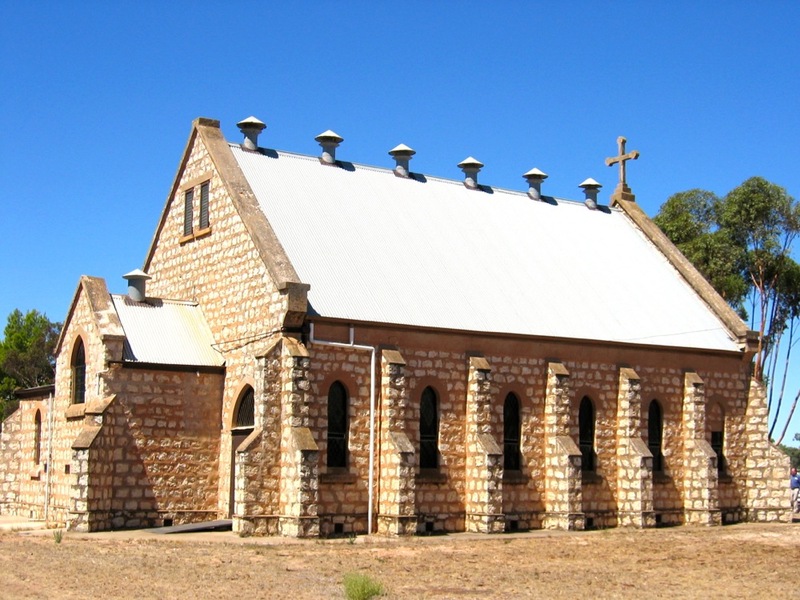 It was transported on a truck from Melbourne by Ross Heinrich and was renovated and installed by the Pipe-organ Company Hill, Norman and Beard. Since it contains diapason, flute, string and reed sounds, it can be viewed as four organs in one. With this variety of sounds, along with the melodies and rich harmonies played on it, this pipe-organ will certainly continue to add greatly to the Pella community’s spiritual and cultural life and experiences for many years to come. The 10am church service on Sunday 15th featured nine hymns, including “Now thank we all our God” and “Praise My Soul the King of Heaven”. Some of the hymns were sung at the dedication in 1911. The verses of the hymn “The Church’s One Foundation” provided the context for the four Bible readings and short addresses by previous Pastors John Prenzler, David Kent and Graham Jenke and by current Pastor Andrew Ruddell. The four readings introduced the themes of Solomon’s prayer of dedication in 1 Kings 8:22-30; of Psalm 84’s appreciation of Yahweh’s dwelling place; of the living stone in 1 Peter 2:1-9 and Jesus at the Feast of Dedication in John 10:22-30. The preludes, postludes and hymns accompanied by John Noack on the pipe-organ, by Grant Fiedler on the trumpet, by Karen Konig on the recorder and by Shelby Eckermann on the flute added to the majestic and festive nature and atmosphere of Pella’s Centenary Celebration. After the mid-day meal, the plaque commemorating this Centenary was unveiled by a member of the Keller family, as the eldest member of the Pella community. Then followed a presentation of musical items in the church, featuring the Fuller pipe-organ, the trumpet and the recorder. The trumpet and organ presented “Air on a G String” by J.S. Bach and “Trumpet Tune” by Henry Purcell; the recorder and organ presented “Ashgrove” and “Crown Him”; all instruments presented “Jesu Joy of Man’s Desiring” by J.S. Bach and the pipe-organ music included Louis Couperin’s “Chacone”, S.S. Wesley’s “Choral Song”, Samuel Wesley’s “Old English Melody”, J.S. Bach’s “Prelude and Fugue in A Minor” and “Toccata in D Minor” and Max Drischner’s Chorale Prelude “Lobe den Herren”. All who attended were no doubt very grateful to the Centenary Committee, including Mark and Ross Heinrich, Eunice Drendel, Ruth, Russell and Michael Eckermann and Glenda Keller, as well as other energetic Pella folk, for their planning and hard work, which made this Centenary Celebration such a success and for the re-issuing of “The Story of Pella” in such an attractive format. The Centenary Celebrations, the very lively discussions and the musical presentations certainly provided participants with an exhilarating Centenary visit to Pella.